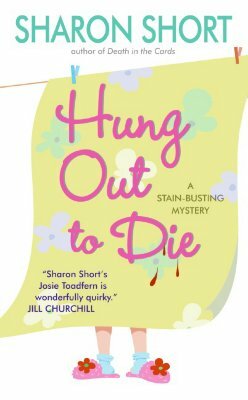 Small-town laundress Josie Toadfern has her own fair share of dirty laundry—namely the Toadfern clan! Ostracized from the family unit ever since her parents dumped eight-year-old Josie in a local orphanage, the stain-busting dynamo's stunned to find herself invited to crabby old family matriarch "Mamaw" Toadfern's Thanksgiving celebration—and too curious to refuse. But an even bigger shock is waiting for her there: Josie's long lost mom and pop, blandly unapologetic and full of new—probably illegal—get-rich-quick schemes. And when a dead body is tossed into the already explosive chaos of bitter feelings, intra-family feuding, and incinerated turkey meat, Josie finds herself in the most uncomfortable position of having to prove her disreputable dad innocent of murder. But cleaning up messes is Josie's business. And sometimes blood is thicker than cranberry sauce—and a much more difficult stain to eliminate.